In their penultimate pre-election issue, the editors of The New Yorker wrote confidently: “On November 8, barring some astonishment, the people of the United States will, after two hundred and forty years, send a woman to the White House.” Yet two months later, Donald Trump is moving into the White House, while the American majority is left trembling in astonishment—an enervating astonishment that has, for the most part, generated only noisily ineffectual protest and self-lacerating despair. Yet we do have a constructive political alternative to astonishment: We have cities. The American political map is not blue states versus red states, two multicultural liberal coasts flanking a homogenized heartland of rural/suburban conservatism. Rather, it’s a nationwide canvas of rural and exurban red, accented evenly right across the continent with splotches of blue. These blue clusters are blue cities, where people live because they believe in public goods, appreciate diversity, support creativity, and define their relationship to the interdependent planet in terms of cooperation rather than rivalry, networking rather than independence. They face forward, moving with history’s winds at their backs. They recognize that globalization cannot be rolled back but must be democratized. They look to bridges, not walls, as instruments of accommodation. It is these cities and their denizens that offer us a progressive path forward, notwithstanding Trump or the rising reactionary European nationalists at war with the European Union. We need to focus less on who is in the White House and more on who is in City Hall. Urban district councils can count for more than the Senate. Congress may be bent on undermining democracy, but the metropolis is where the antidote—checks on abusive central-government power—can be found. There is a potent vertical separation of powers implicit in the Ninth and 10th Amendments to the Constitution, and it can serve as both a check on the abuse of executive authority in the White House and a prompt to actions that can preserve and even advance the progressive agenda in dark times. Particularly when they act in concert, cities—home to nearly 63 percent of the US population—can secure and promote sustainability, immigrant rights, tolerance for diversity, and a struggle against terrorism that doesn’t become a war on Islam. 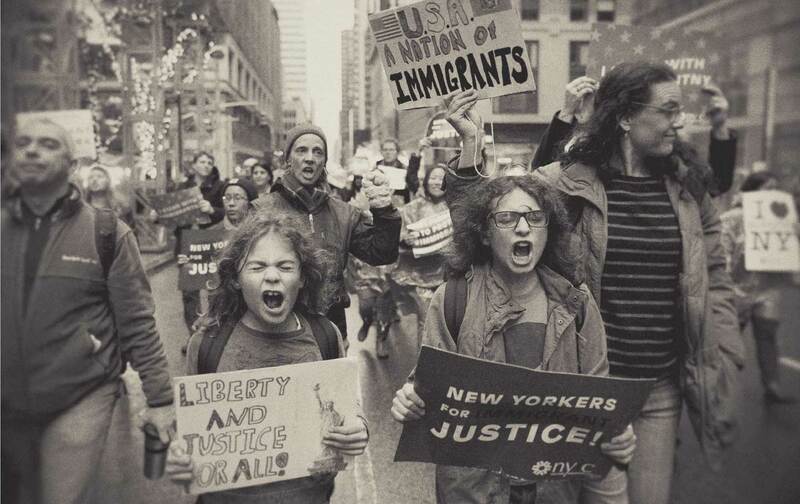 More immediately, cities can shield their communities against assaults on the rights and civil liberties of immigrants, Muslims, minorities, women, and other people under threat from a xenophobic central government and nationalist politicians. The vertical separation of powers isn’t just a theory; it’s a rationale for the resistance and action by cities already well under way. Jacques Derrida asked some 20 years ago, “Could the city, equipped with new rights and a greater sovereignty, open up new horizons of possibility, previously undreamt of by international law?” The answer, clearly, is yes. And mayors, sensing the “new rights,” know it. We need to focus less on who is in the White House and more on who is in City Hall. These mayors, and the residents who make their cities spin, have been grabbing hold of this new authority, using it to fight for opportunity and against inequality since well before Trump set his sights on the White House. We have seen it in cities like New York and Chicago, where the Fight for $15 was born more than four years ago. We have seen it in the successful, city-based campaigns for paid-sick-leave legislation, fair-workweek initiatives, and universal pre-kindergarten programs. And a couple of years ago, we saw it when a coalition of 25 mayors and local leaders, recognizing the need to embrace and protect new immigrants, launched Cities for Action. Since then, the coalition, which has grown to more than 100 mayors, has supported President Obama against the Supreme Court ruling in United States v. Texas, which blocked his executive actions on immigration. The coalition also includes a number of sanctuary cities that have promised to protect immigrants. California, which is the world’s sixth-largest economy, is also in effect America’s largest city (with Oakland’s ex-mayor as its governor and San Francisco’s ex-mayor as its lieutenant governor). It is pledging to counter federal actions aimed at sanctuary cities and undocumented immigrants. It has the full-throated support of sitting mayors like Eric Garcetti of Los Angeles. It may seem hyperbolic to refer to such bold municipalities as “rebel cities,” as geographer David Harvey has done in describing today’s “urban revolution.” But then you hear Governor Jerry Brown insisting that “If Trump turns off the satellites, California will launch its own damn satellite!” Or you catch New York City Mayor Bill de Blasio challenging Trump in a bracing speech just two weeks after the election: “If all Muslims are required to register, we will take legal action to block it. If the federal government wants our police officers to tear immigrant families apart, we will refuse to do it…. If the Justice Department orders local police to resume stop-and-frisk, we will not comply,” de Blasio vowed. What mayors are realizing is that a fundamental devolution of power is under way—one that began well before the triumph of reactionary populism in Europe and the United States. This devolution revolution acknowledges the bottom-up character of democratic sovereignty and puts muscle on the bones of the vertical separation of powers; it is rewriting the social contract in the very way that Derrida foresaw. The federalist principle, encoded in the Ninth and 10th Amendments (the Second Amendment isn’t the end of the Bill of Rights), offers the rationale for a vertical separation of powers: “The enumeration in the Constitution of certain rights shall not be construed to deny or disparage others retained by the people,” reads the Ninth. And “the powers not delegated to the United States by the Constitution, nor prohibited by it to the states, are reserved to the states respectively, or to the people,” adds the Tenth. In this new world without borders, the cosmopolitan voice is also history’s voice. In Hershey, Pennsylvania, right before the election, Trump taunted: “From now on, it’s going to be America first. There is no such thing as a global anthem, a global currency, a global flag.” Yet city dwellers will demur. A global anthem? How about the “Ode to Joy” (the choral movement of Beethoven’s Ninth Symphony, with its stirring line “All people will become brothers”)? A global currency? How about H2O: Water creates and sustains life on our planet without borders and can only be protected and conserved through cooperation. As for the global flag that Trump can’t conjure, just Google Blue Marble—that very first image of our stunning Earth taken in 1972 from outer space, in which neither frontiers nor nations can be seen, only a bounteous but vulnerable planet. For all his bombast, Trump’s nationalism is in fact parochialism. Once upon a time, it was “liberal” nations that aspired to universality, while local jurisdictions were provincial and particularistic. Today, the valence is reversed: Cities speak to global common goods—marriage rights, minimum wage, climate action, creative culture, respect for diversity, refuge for immigrants—while nations have turned inward and xenophobic. Urbanity is a global virtue associated with diversity and multiculturalism; nationalism has a parochial character that hunkers down behind walls. In this new world without borders, where no one nation can solve global problems alone, the cosmopolitan voice is also history’s voice. So as we watch the Republican Party try to undo Obama’s legacy and close the road to immigration and inclusion, we need to listen to the voice of cities: to mayors Eric Garcetti of Los Angeles and Marty Walsh of Boston on the coasts, but also to mayors from the heartland like Megan Barry of Nashville and Kasim Reed of Atlanta; to notable Democratic mayors like Bill de Blasio of New York and Michael Hancock of Denver, but also to Republican mayors with urban agendas like Mick Cornett of Oklahoma City and Richard Berry of Albuquerque, who are attuned to urban challenges rather than party ideology. They will tell you that what they share with Paris and Cape Town and Seoul and London is as important as what they share with Washington, DC. They will remind us that in order to hear the voice of England after Brexit, we must listen to the voice of Marvin Rees, the newly elected biracial mayor of Bristol, and of Sadiq Khan, a Pakistani bus driver’s son who is now the mayor of London. They will rebuke the claim of the National Front’s Marine Le Pen—who says that France and the United States are finally bound together by a shared contempt for Muslims and fear of immigrants—by pointing to Anne Hidalgo, the Spanish-born mayor of Paris. Hidalgo is the new chair of the C40 Cities Climate Leadership Group, and she’s working to forge a “Metropolis of Greater Paris” that incorporates both the wealthy inner city and the immigrant suburbs. Trump is no more the sole source of an American view on immigrants than Geert Wilders, Holland’s anti-Muslim rabble-rouser, is the sole voice of the Dutch view. Listen, rather, to Ahmed Aboutaleb, the immensely popular Moroccan-born mayor of Rotterdam, or to Jozias van Aartsen, the mayor of The Hague, who hosted the founding meeting this past September of a new Global Parliament of Mayors, which may become for cities what the United Nations once hoped to be for nations. As Trump assumes power, the simple truth he will have to accept is that nation-states are in trouble, not least because of the kind of assaults on their legitimacy that he embodies. And national governments are in disarray, from Brazil and Belgium to Hungary and the Philippines—not least because they’ve refused to recognize the blunt realities of interdependence. The road to prosperity, no less than the road to global democracy, runs not through nations but through cities. I know how you feel. I understand Hillary’s sense of outrage. It makes me mad, too. Sure, we lost our base in the South; boys voted for Gingrich. But let me tell you something. I know these boys, I grew up with them. Hardworking, poor white boys who feel left out… Think about it, every progressive advance our country has made since the Civil War has been on their backs. They’re the ones asked to pay the price of progress. Now, we are the party of progress, but let me tell you, until we find a way to include these boys in our programs, until we stop making them pay the whole price of liberty for others, we are never going to unite our party, never really going to have change that sticks. Clinton’s prophetic words come tumbling down across the decades, a frenzied echo from an American past that, having been ignored, defeated Hillary and now stands ready to take the future of the United States hostage. But however justified the anger, however deaf that Democrats and liberals have been to the voices of these “poor white boys,” we cannot afford to make war on each other, or on history. In remembering America’s forgotten, we cannot forget the world of 7.3 billion people, most of whom are neither American nor white nor “Western,” and the majority of whom live in cities, with whom our survival is inextricably bound and from whom no wall can divide us. We cannot permit President Trump to transform the resentment of power into its concentration and abuse. This will now be the task of cities, which must find a way to acknowledge these grievances without scapegoating the very people whom the aggrieved are encouraged to blame. It is cities that must find a way to allow blacks and whites to join in opposition to monopoly power rather than, by being set against each other, to ensure its consolidation. It is in cities like Chicago—where Martin Luther King Jr., toward the end of his life, devoted himself to the pursuit of racial justice in his Operation Breadbasket, and where gang violence and urban murder today belie the proud dreams of cosmopolitans—that urban sovereignty will have to prove itself. Ironically, Donald Trump is a city boy from Queens. So despite his gift for manipulating the fears and resentments of those who despise everything the city stands for, maybe Trump can find a way to listen to the voice of cities as well as those of the suburbs and countryside. Or maybe cities will make him.